Headaches and facial pain are often the cause of great suffering to many people, and the source of this pain may simply be an irregularity in the way people bite. Successful treatments for headaches and facial pain can be found by visiting your dentist who will asses if your bite is the underlying cause of your pain. Many people are unaware that they suffer from any types of irregularity with the way their teeth fit together. Instead of their teeth actually fitting together properly most people will fit their teeth together for comfort rather than for position. By doing this, strain can be placed on the jaw muscles without the person actually realising it. This tension in the muscles can cause pain in the jaws, neck, back and shoulders, and can bring on migraine headaches. Many people can go for years unaware that they have a problem simply due to the fact that there are no painful symptoms. But it may only take the smallest change, such as an incorrectly fitted crown, for the painful symptoms to occur. Malocclusion is the term used for bites that are misaligned, and your dentist will be the one to seek help from if this is becoming a problem. Chronic headaches, backaches, or tension in the shoulders. Grinding or clenching teeth at night. Repeated pain in the face or around the jaws. Clicking when opening the jaws. Difficulty in opening the jaws. Dental work or loss of teeth that may lead to an imperfect bite and subsequent pain. If you awake in the morning and feel tension in your jaws, then you may have spent the night clenching them or grinding your teeth. A visit to the dentist should be arranged in order for the problem to be assessed. The jaw joint known as the temporomandibular joint (TMJ)is the joint that helps as many teeth come together correctly as possible. If over activity of this joint occurs due to misaligned teeth then this can cause muscle spasms, and could be the cause of headaches and facial pain. 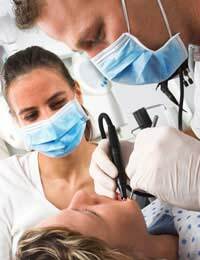 Dentists will have various techniques and treatments for headaches and facial pain caused by the TMJ at their disposal. Dentists will first need to asses whether there is malocclusion. He or she will use a number of techniques including bite tests and the use of sonography and migraine treatment technology. Models of your teeth will be made for the dentist to analyse and to help make an assessment. Treatment for muscle disorders such as these are usually simple and can alleviated with the use of an artificial bite fitting that can be worn over the teeth. This should, over a period of time, help correct the malocclusion. Other dental work may be required such as readjusting or refitting badly placed or ill fitting crowns and dentures. The treatments for headaches and facial pain available through dentists may relieve some, or all of the symptoms of jaw muscle related pain. However, there are no guarantees and the symptoms could mean other underlying problems will need to be looked into. If you do suffer from this type of pain then it will be in your best interests to schedule a dental appointment.